I sort of hesitate to admit it, but I haven’t always been “all about trails.” As a rock climber in my pre-kid era, I always thought of trails as merely a necessary mode of transportation to get to the base of the cliff (where the adventures would REALLY begin.) It’s not like I hated hiking or anything, but hiking just for the sake of hiking always seemed a little boring to me unless you were actually GOING somewhere to DO something – climb, swim, picnic, or even just a spectacular vista. The main attraction was the final destination, and the means to get there was…well, just a means to get there! Then I became a mama. And I started seeing what a simple walk in the woods was like from the eyes of a child. First, as a newborn wrapped against my body – so safe and snuggly, eyes filled with wonder gazing up into the treetops. Then in just a few months, crawling into every nook, cranny, and crevice, while examining every rock, leaf, and twig he could get his hands on. By the time he was a curious toddler, he was off and running…and falling…and running…and falling. 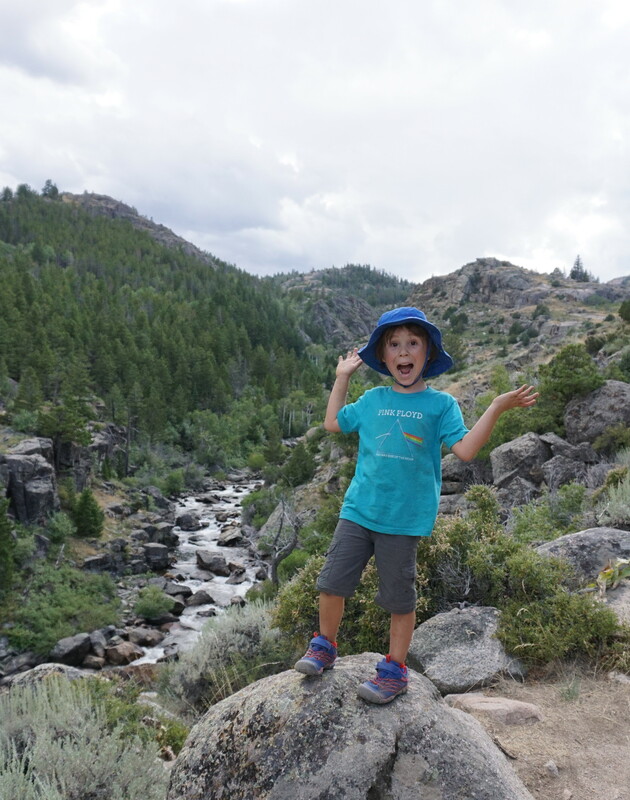 Now, as an inquisitive 5 year old boy, hikes are filled with impromptu science lessons and other teachable moments. But my son (and now daughter as well) are not the only ones learning out on the trail. Motherhood has taught ME that the journey can be just as important as the destination. Hiking to the crag takes us twice or even three times as long with our kids in tow. But the experience is twice as rewarding. Stopping to toss rocks in the stream rather than quickly passing by may mean we get in one less route on the day. But the gleeful squeals of a preschooler that come after every “plunk” make our pit stops worthwhile. And the blissful babbles of our 18 month old every time we stop to smell a blooming rhododendron are equally satisfying. Enjoying a serene pit stop along Ten Sleep Creek. So in some ways, I (and my growing family) have come full circle. 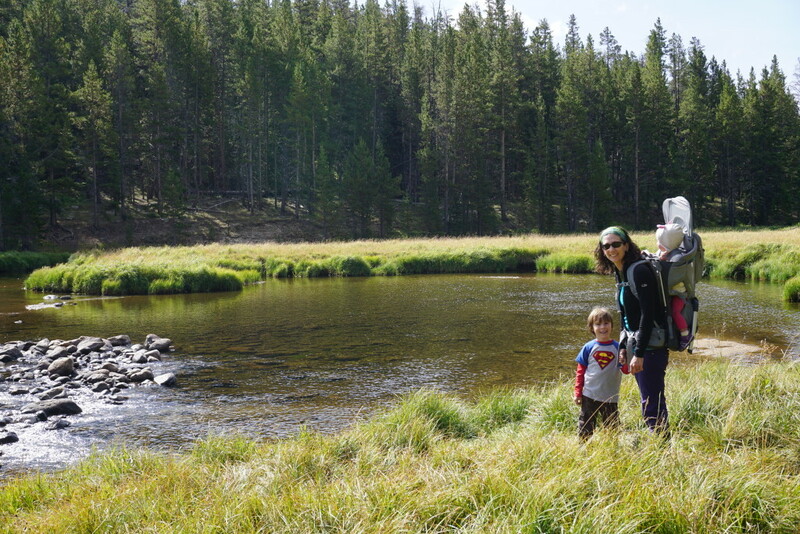 Now when I plan our climbing trips, our itinerary is peppered with plenty of family hiking that’s just as much about the GETTING THERE as it is the THERE. Sometimes it’s a rest day hike through mountain meadows in search of wildflowers and butterflies. Other times it’s just a brief mountain stroll to stretch our legs on a Friday night before setting up our tent. And those old, familiar climber trails that were once nothing more than a mode of transportation? They are now seen as a catalyst for family interaction. EVERY TRAIL CONNECTS. Whether we are on the way to the base of the cliff, a gorgeous mountain panorama, or on the way to nowhere in particular, trails are always at the heart of bringing our family closer together. Which brings me back to REI’s campaign…as I mentioned, there are 10 worthy trail projects that will be receiving funding. The division of funds was determined by an online vote – head over here to explore more about each trail, as well as learn about how to get involved in a local stewardship project in your area. And while you’re at it, please feel free to share your own thoughts below about your favorite trails and why they are meaningful to YOU.